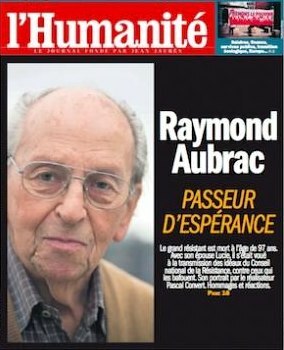 France is celebrating the life of Raymond Aubrac, one of its last great heroes of the resistance, whose bravery and exploits with his wife Lucie against the Gestapo became the stuff of legend and film. Aubrac, who died at age 97 in a military hospital in Paris on Tuesday, was, along with his late wife, a leading figure in the underground fight against Nazi occupation. Born into a Jewish family, he studied engineering and law in France and at Harvard and MIT. His parents were deported to Auschwitz and killed in 1944, after which he and his wife joined the French Resistance in 1940. He remained an activist to the end, visiting schools and colleges to talk about his wartime experiences.